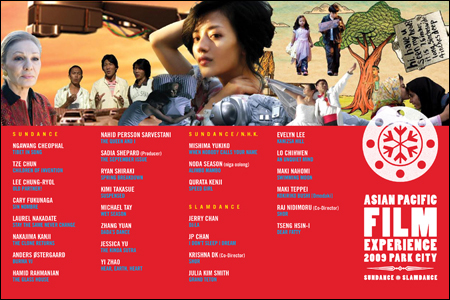 RSVP by Friday, Jan 16 to: AsianPacificFilm@gmail.com with "Park City RSVP" in the subject line. Learn more about funding, distribution and exhibition for Asian Pacific American films at our annual outreach session. For more information, go here. It's all sponsored by Visual Communications (VC), Center for Asian American Media (CAAM), Asian CineVision (ACV), San Diego Asian Film Foundation (SDAFF), Asian Pacific American Film Inc., Process Space Consulting, APA First Weekend Club, and David Magdael & Associates. So yeah, things came together sort of last minute, but it looks like I'm going to Park City. For sure, I'll be at the reception, but other than that, I'll be trying hard to scrounge up tickets to anything and everything. If anyone's got the hook up... hook it up!